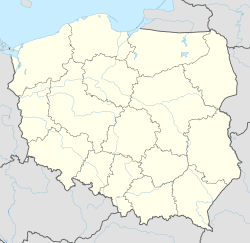 Łowicz [ˈwɔvʲit͡ʂ] is a town in central Poland with 28,811 inhabitants (2016). It is situated in the Łódź Voivodeship (since 1999); previously, it was in Skierniewice Voivodeship (1975–1998). Together with a nearby station of Bednary, Łowicz is a major rail junction of central Poland, where the line from Warsaw splits into two directions - towards Poznań, and Łódź. Also, the station Łowicz Main is connected through a secondary-importance line with Skierniewice. Łowicz was a residence of Polish primates in the Polish–Lithuanian Commonwealth. They served as regents when the town became a temporary "capital" of Poland during the interregnum. As a result, Łowicz has its own bishop and a basilica in spite of its considerably small size. The ruins of a former bishop's castle can be found on the outskirts of town. Napoleon Bonaparte is believed to have stayed in one of the houses on the main square. Also, the town was at the centre of the largest battle of the German invasion of Poland, the Battle of the Bzura River in the opening campaign of World War II. Łowicz has an important ethnographic museum (Muzeum w Łowiczu) exhibiting Polish art and historical artifacts from the region. Also, Łowicz features a popular skansen with traditional wooden houses. It is a vast open-air display of historical structures depicting traditional Polish village-life; a collection of artifacts spread over a 17-hectare (42 acre) site, just outside the town. Łowicz has also a football team called Pelikan, who languish in the lower divisions of the Polish leagues. Near the town is the Maurzyce Bridge, the first welded road-bridge in the world, built in 1928 across the river Słudwia. It was designed in 1927 by Stefan Bryła from the Lwów University of Technology. The history of Lowicz dates back to the 12th century, when a gord, which guarded the swampy Bzura river ford existed in the location of the castle. Lowicz, spelled as Loviche, was first mentioned in a papal bull of Pope Innocent II, on July 7, 1136. In this document, the pope confirmed the right of the Archbishops of Gniezno to own local land. In 1214 or 1215 at Wolborz, Piast Dukes of four Polish provinces: Leszek I the White of Kraków, Konrad I of Masovia, Wladyslaw Odonic of Kalisz and Casimir I of Opole issued the so-called Immunity Privilege, in which they confirmed the fact that Archbishops of Gniezno owned Lowicz. At that time, Lowicz was still called villa (village), even though the archbishops’ mansion already existed here. It is not known when Lowicz received town charter. First document which calls it oppidium (town) dates back to 1298, and was issued by Duke Boleslaw I of Płock. Before that, in 1263, Lowicz was ransacked and burned in a Lithuanian raid. According to chronicler Jan of Czarnkow, in ca. 1355 Archbishop Jaroslaw of Bogoria and Skotnik built a brick Gothic castle in the location of the former gord. The castle became one of residences of Archbishops of Gniezno and Primates of Poland. Furthermore, in ca. 1358, he granted Magdeburg rights to the newly established New Town (Nowe Miasto). New Civitas of Lowicz was located east of the old gord, along the Bzura and around the wooden church, which stood in the location of contemporary Cathedral Basilica. In the late Middle Ages Lowicz was the seat of a castellany. Located on the border between the Kingdom of Poland and the Duchy of Masovia, it remained under firm control of the Gniezno Archbishops. In the mid-14th century Lowicz, together with 111 adjacent villages, was the biggest church property in Poland. On May 17, 1359, Siemowit III, Duke of Masovia confirmed the ownership of Lowicz by the Gniezno Primates. Nevertheless, the dukes of Masovia on several occasions tried to place Lowicz under their authority, which resulted in conflicts with Polish kings, who supported the Archbishops. On April 8, 1382, Siemowit IV, Duke of Masovia besieged Lowicz, and such conflicts occasionally returned until the annexation of Mazovia into Poland. Lowicz prospered in the 15th century. In 1404, Archbishop Mikolaj Kurowski funded the first brick church in town, and a new Roman Catholic parish. In the 1430s, old wooden church in Lowicz’s Old Town was replaced by a brick, Gothic complex. On April 25, 1433, Archbishop Wojciech Jastrzebiec named it a Collegiate church, and soon afterwards, a branch of Kraków Academy was established here. On October 24, 1419, Archbishop Mikolaj Traba confirmed the town charter of Lowicz and unified legal regulations of the three districts of Lowicz: Podgrodzie (Suburb), Stare Miasto (Old Town) and Nowe Miasto (New Town). In 1443, a town hall was built in the market square of the Old Town. Due to its convenient locations, multiple royal privileges and frequent fairs, Lowicz prospered. The town remained under the authority of the Archbishops of Gniezno, and as a residency of the Primates of Poland, Lowicz occasionally served as a second capital of the Kingdom, during the periods known as interregnum. The period of prosperity ended after the disastrous Swedish invasion of Poland (1655 - 1660). Almost completely destroyed, Lowicz never regained its importance and turned into a small, local town. Nevertheless, it remained a cultural center, as in 1668 one of the first Piarist Colleges in Poland-Lithuania was opened here. After the Second Partition of Poland (1793) Lowicz was annexed by the Kingdom of Prussia. In 1807 it became part of the Duchy of Warsaw, and from 1815 until 1915 it belonged to Russian-controlled Congress Poland (later Vistula Land). In 1820, the real estate of the Archbishops of Gniezno became the property of Grand Duke Constantine Pavlovich of Russia and his wife Joanna Grudzinska, who was granted the title of the Duchess of Lowicz. On July 9, 1822, Tsar Alexander I of Russia formally established the Duchy of Lowicz. In 1831, following the last will of Joanna Grudzinska, the Duchy of Lowicz became the property of Polish rulers. Since at that time Russian Tsars regarded themselves as Kings of Poland, the duchy belonged to them until World War I. Following the request of General Ivan Paskevich, who was the governor of Poland, Tsar Nicholas I of Russia gave permission for construction of the first railroad in Russian Poland. The Warsaw–Vienna railway was completed in 1848, giving Lowicz rail connection with Warsaw, Kraków, Vienna and Breslau. In 1861, Lowicz Glowny railway station was built. Due to the construction of additional line to Koluszki (November 1866), Lowicz emerged as a rail hub, which contributed to its development. Following the Act of 5th November, the Duchy of Lowicz was annexed into the Kingdom of Poland (1916–18), which was a puppet state of the German Empire. In the Second Polish Republic, Lowicz and the County of Lowicz belonged to Warsaw Voivodeship, but on April 1, 1938, it was moved to Lodz Voivodeship (see Territorial changes of Polish Voivodeships on April 1, 1938). During the Invasion of Poland, the Battle of Bzura took place in the area of the town. Lowicz itself was captured by the Wehrmacht on September 8, 1939, to be recaptured by the Polish Army three days later. Between September 14–16, the town changed hands three times. Finally, Polish forces abandoned Lowicz in the night of September 16/17, 1939. German occupation of Lowicz lasted until January 17, 1945. In 1940, during the Nazi Occupation of Poland, German authorities established a Jewish ghetto in Łowicz, in order to confine its Jewish population for the purpose of persecution and exploitation. The ghetto was liquidated in March 1941, when all its 8,000–8,200 inhabitants were transported in cattle trucks to Warsaw Ghetto, the largest ghetto in all of Nazi occupied Europe with over 400,000 Jews crammed into an area of 1.3 square miles (3.4 km2). From there, most victims were sent to Treblinka extermination camp. ruins of Gothic castle of Primates of Poland, built in ca. 1355 by Archbishop Jaroslaw of Bogoria and Skotniki. The complex was ransacked and destroyed by Swedish invaders in 1655. ^ Population. Size and Structure and Vital Statistics in Poland by Territorial Division in 2016, as of December 31 (PDF). Warszawa: Główny Urząd Statystyczny. 2017. p. 114. ISSN 2451-2087. ^ "Museum in Lowicz - The History and the Collections". Muzeum Łowicz. Retrieved 2008-04-30. ^ Sapp, Mark E. (February 22, 2008). "Welding Timeline 1900-1950". WeldingHistory.org. Archived from the original on August 3, 2008. Retrieved 2008-04-29. This page was last edited on 23 June 2018, at 07:47 (UTC).